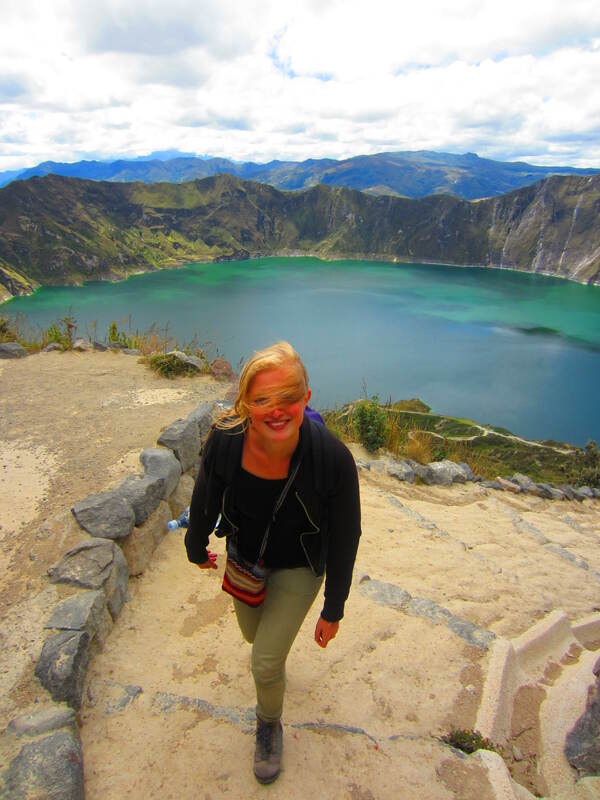 Lilian and I grabbed a bus heading to Quilotoa because we’d decided after much consideration to do the Quilotoa loop in the regular direction. A number of people in our hostel had elected to do the loop in reverse, arguing that the additional altitude would help them train for Cotopaxi. I personally didn’t think that an extra 600m of ascent would really make that big of a difference in my physical conditioning, and Lilian was quite happy to do the loop descending more than ascending. 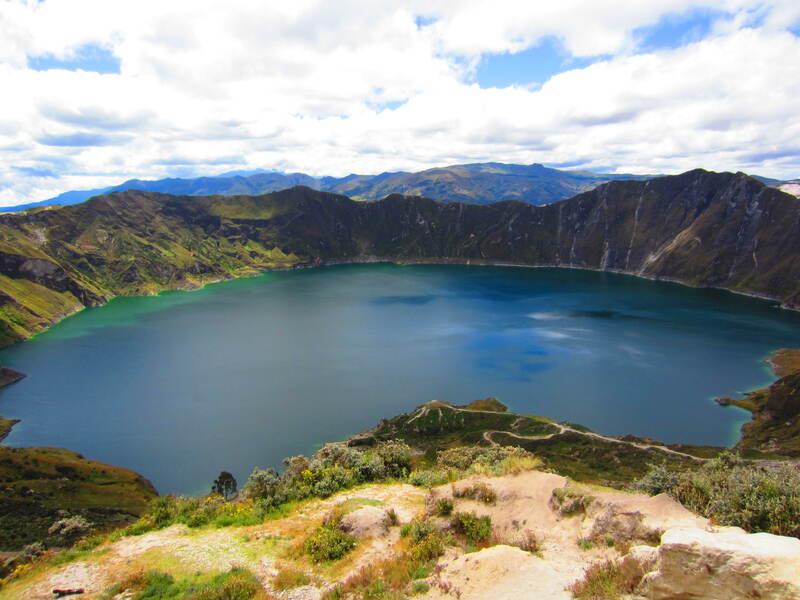 Quilotoa lake itself is said to be one of the most beautiful locations in Ecuador. It is actually an extinct volcanic crater that’s filled with water, like Crater lake in Oregon. 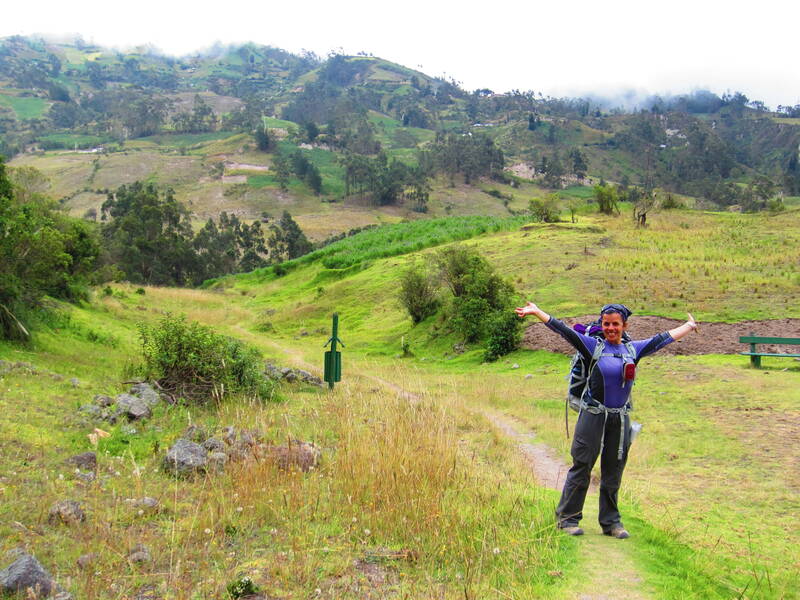 The loop itself is a rural hike through hillsides dotted with lots of Kichwa indigenous villages and farms. 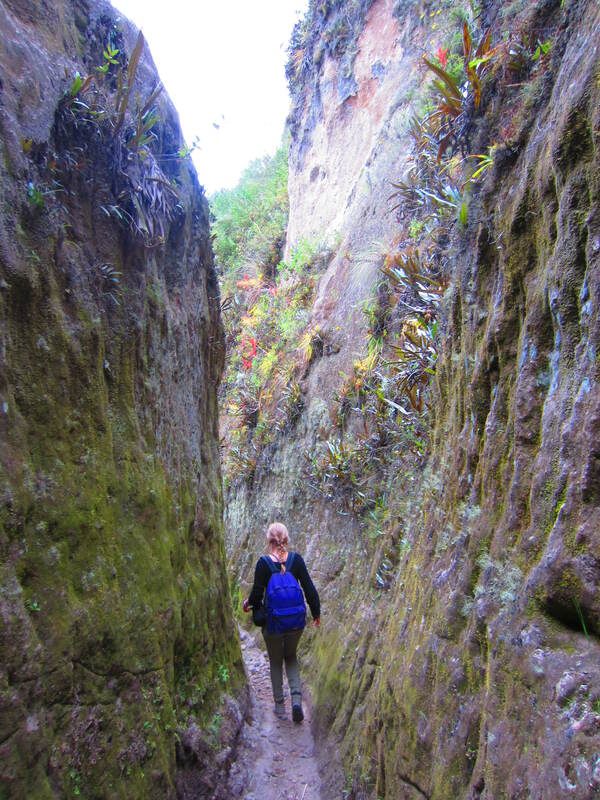 By the time Lilian and I left the viewpoint area that was packed with day trippers, and headed west along the crater rim towards the village of Chugchilan, our destination for the first night, we had the trail to ourselves. We had rudimentary maps and a detailed description of the route and with a little luck, we intended to guide ourselves through the hike, despite having a number of “guides” try to convince us that we’d get lost and that it wasn’t safe for us to walk without them. The views across the lake itself were beautiful, green hills set against the turquoise of the water. The ground was also covered with a variety of beautiful wildflowers. At 3800m, there was all-too-familiar thin air to breathe, but we were lucky with only a few clouds in the sky and some sunshine warming our skin. The hike was relatively easy and passed through a few villages where we had some interactions with local children who squealed when we showed them photos we’d taken of them. 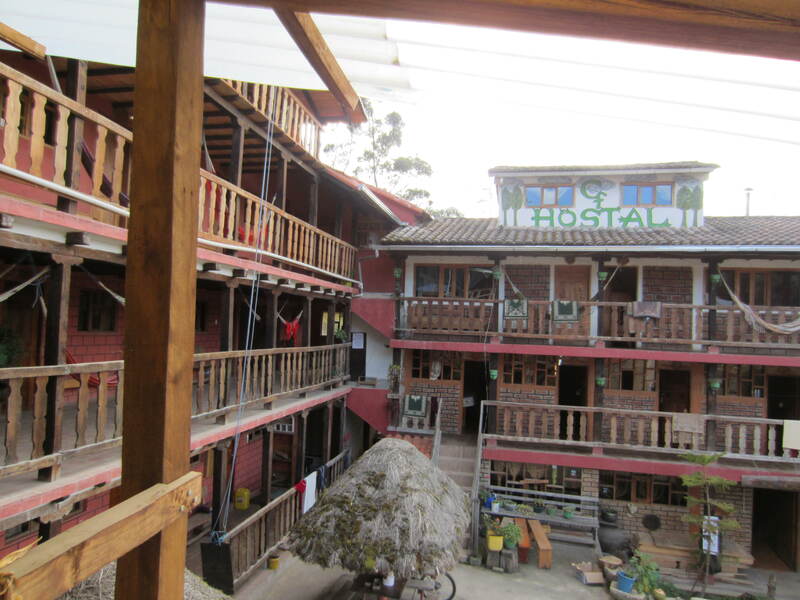 Arriving in Chugchilan, we walked into The Cloud Forest Hostel and were immediately greeted by the manager, who turned out to be the single most hospitable Ecuadorian I’d met to date. He told us that everyone was in the TV room watching the US play Belgium, so, despite my reluctance up to this point to watch the World Cup, I was more than happy to settle down on a couch with a beer and some chips after our long hike. The hostel itself was absolutely lovely and was an incredible deal at $15 each for a private room, VERY hot shower, dinner, and breakfast. Our room had five beds, including a double up in a loft that you could reach via a step ladder. 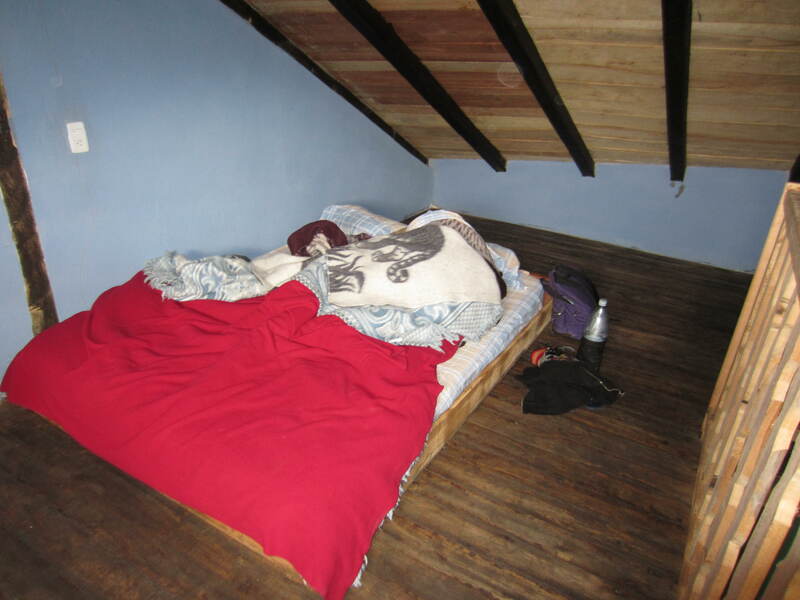 It had a sloping roof and a lovely triangle window and Lilian and I immediately loved it and decided to sleep here together because we had a higher likelihood of staying warm. We killed a few hours singing songs together from our respective iPods. I couldn’t believe I’d met someone who enjoyed singing as much as I did, and that she loved the same music I did. She squealed with joy when she saw that I owned “Just Around the Riverbend” from Pocahontas because it was one of her favorite songs…and it became the anthem of our five days’ traveling together. I’m sure the people in the room next door just loved us. Our meal was delicious and I was excited to meet a couple from Colorado who had just climbed and summited Cotopaxi. They described their experience and it got me very excited, in a nervous way of course, to get there as soon as possible. Since Lilian’s ankle was bothering her greatly, and our host pointed out that Ecuador’s most authentic indigenous market was taking place the day after next in Saquisili, we decided to follow his suggestion and hike out to Sigchos the next day instead of spending another night in Isinlivi. Our host assured us that it was an easy walk and only 11kms, the same as the walk to Isinlivi. Which turned out to be untrue (shocking, I know.) In fact, looking at the map the following day, I wondered how I never questioned how Chugchilan-Sigchos could possibly be the same distance as Chugchilan-Isinlivi, when the latter is clearly about half the distance. In the end, the hike took over six hours, and we got lost repeatedly. We also got the fright of our lives by twice being chased by teeth baring nasty dogs trying to protect their territory. We approached a farm and from a distance I spotted a large angry dog running full speed towards us barking his head off. Lilian stayed calm and calmly instructed me to pick up a rock, not make eye contact, and back up slowly up the trail. I was having a strong fight or flight response and the adrenaline was pumping through my body – not helped by the shrieks of the dog’s owner who kept trying to call her pup back home. Thank God we didn’t get bit. The last part of the hike was a super steep slog up a road. The directions clearly stated that we had to be on the lookout for switchbacks heading up the mountain to the left to get to Sigchos. We found a trail, and I must have climbed over 1500 vertical feet only to find the trail led to a farm and a bunch of pigs on the top of a hillside. So, with lots of backtracking, we eventually gave up on the trail directions and decided to just walk up the same road that vehicles were driving on. It became obvious that we were going to miss the 2:30pm bus, but when we actually saw the bus heading down the mountain towards us, I was super impressed when Lilian staunchly stated that I was welcome to take it, but that she wanted to officially “finish” out hike by walking back to Sigchos. 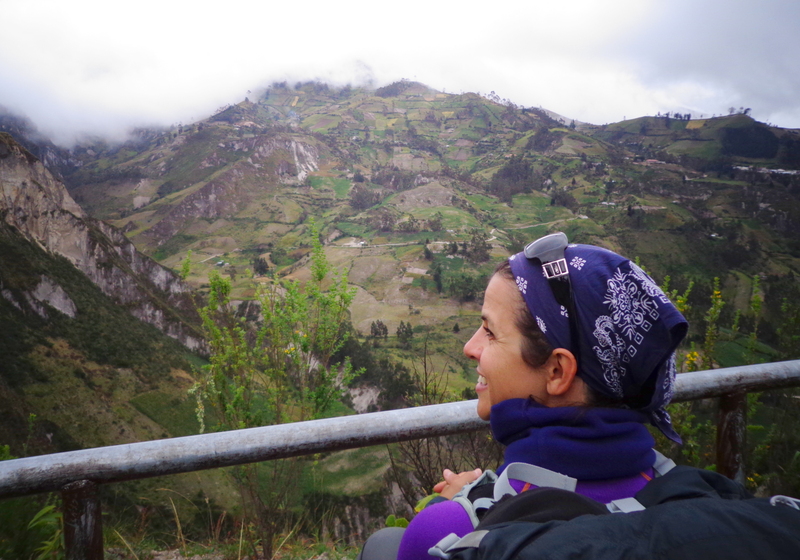 I agreed to join her in the last hour of climbing to the town, and then another half hour to the bus since, of course, the town’s bus terminal was “mas arriba”. 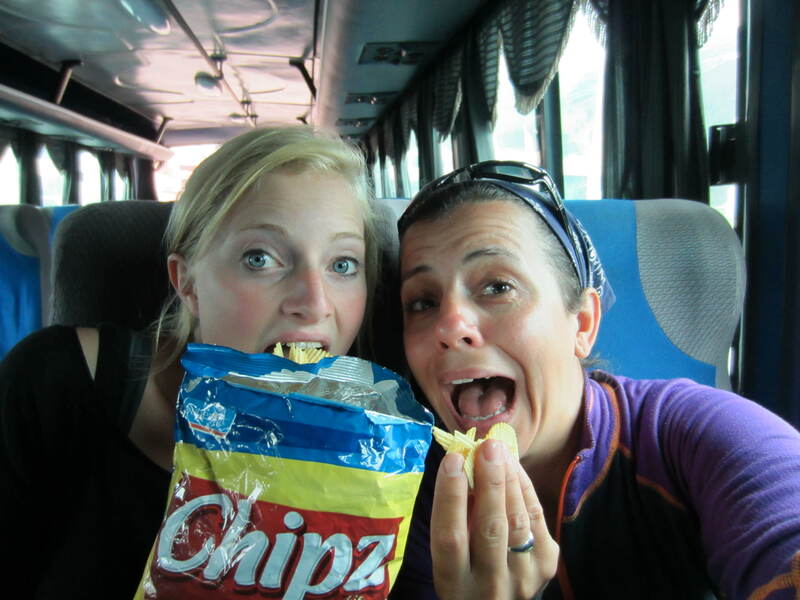 Getting on the bus, we could barely contain our joy as we sat and stuffed our faces with our last bag of potato chips. Those were some incredibly tasting potato chips. Hi Andy, it’s Monica, anita’s sis. Just wanted to say love reading your comments, they make me laugh and smile. So thanks! 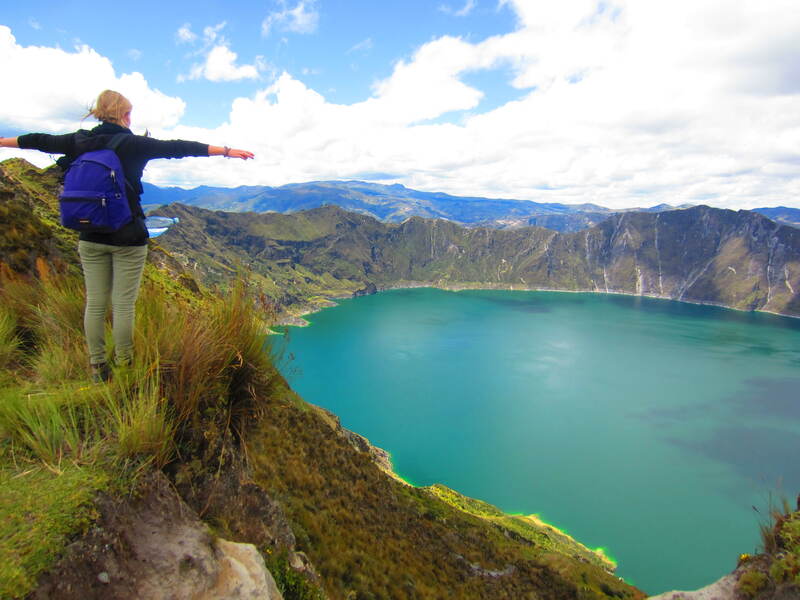 Quilotoa is on my must do list. It looks amazing! 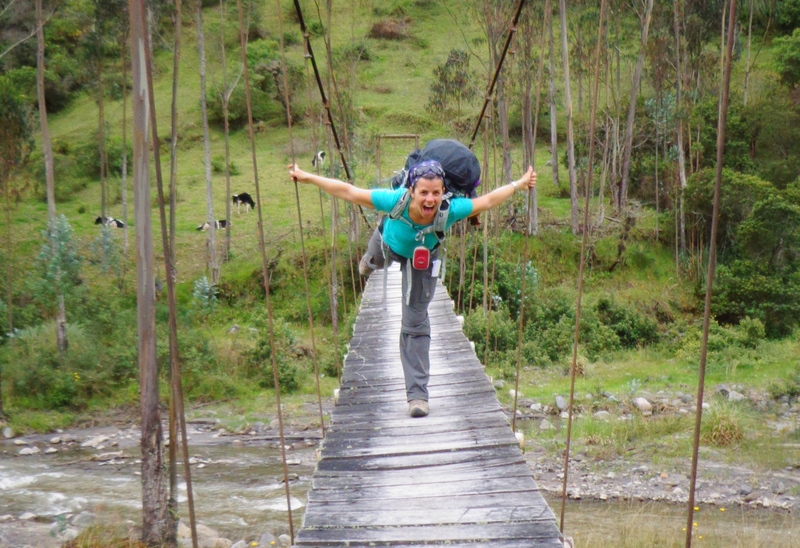 I really enjoyed it, I’m not sure I am able to describe it as amazing after my treks in the Cordillera Blanca and Huayhuash…am spoiled I’m afraid! I wanna hear you singing “Just Around the Riverbend” with Lilian! I bet it was brilliant. I can just imagine your joy at finding a singing partner with similar tastes in music. How sweet! The crater is beautiful, but I know what you mean when you say you are spoiled after the scenery of Peru and the Cordillera Blanca etc. I thought the ten day hike pics were just breathtaking. but still this is lovely and its new and fresh. its nice to have so much choice of scenery! think of me, being stuck in ugly old Wellingborough…LOL! I didn’t realize you’d gone hiking without a guide, I think that’s a first. And the dog incident was terrifying…I don’t know what I would have done, whether I’d freeze in fear or go running for my life. How amazing that Lilian was so calm and collected. Hope you two stay in touch, she sounds like such a wonderful girl. Despite getting lost, glad you made your way back safely. Sounds like an amazing adventure.